Miguel Santana is the president and CEO of the Los Angeles County Fair Association, joining the organization in January 2017. He is one of only five presidents since the Fair’s inception in 1922. Santana is the former City Administrative Officer for the City of Los Angeles, where he reported directly to the Mayor and City Council. 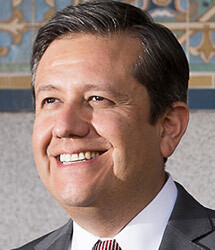 Prior to that position, he served as one of five Deputy Chief Executive Officers for Los Angeles County. He has more than 25 years of experience managing fiscal, legislative, political and community issues. Santana has a Bachelor of Arts degree in Sociology and Latin American Studies from Whittier College and a master’s degree in Public Administration from Harvard University. Santana serves on the boards of the Mexican American Legal Defense and Educational Fund (MALDEF), LA Plaza de Cultura y Artes, United Way of Los Angeles and Discovery Cube Los Angeles.